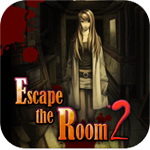 Escape The Room 2 iPhone App Review. I've been dying to play such a game for a long time. I haven't seen something similar to this since Sherlock Holmes (read our review here), but where Sherlock Holmes fell short, Escape The Room 2 thrived. We're looking at an adventure-puzzle-mystery game, where all you have to do is get out of the room you're in. If you can! You have to use your wits, a keen eye for details and your intelligence to find out all the clues, break all the codes and ultimately find the key to the locked door that leads out of the room. As soon as you fire up the game, you'll be presented with a short intro video, first-person view. You can't make out too much from it, except that you've been through some sort of ordeal, your chest hurts and you're borderline unconscious. The next sequence puts you in the first room (Room 0), and a cute girl comes and explains that you've been trapped there for no apparent reason, you've been through an operation that attached some sort of exploding device to your heart, and, in order to make it out alive before the timer runs out, you need to escape the room. The girl tells you this is a game and that she wishes you'll survive it, and that she'll try and help you along the way, but it's up to you to pay attention to your surroundings, find the clues in the room, put them together and get out. To me, it appeared that the outcome of the game is to find out why you've been trapped there. Along the way, you'll find out that it has something to do with your past, and that you've been chosen for this game for a reason. It's beginning to sound more and more like Saw, which definitely got me going. The game offers you a bird's eye view of the entire room, and you can pan to see more by touching and dragging the screen. There's basically three things you can do. Use the hand cursor to pick-up and interact with objects (be it a door, a safe, a book or picking up various memos and miscellaneous objects you can use later). You can use the magnifying glass cursor to inspect objects for clues and hints on what to do next. Once you've picked up objects, they will pop-up in your inventory. From there, you can either select and use them in the room, combine two objects (for example candle + lighter lights the candle), separate an object into more (for example a doll made of string can be separated into just a ball of string) or view details about an object (diaries and memos are read here). In the inventory, you can also do some in-app purchase for various items such as more time on your device, keys and whatnot. If all this seems a bit complicated, it's because it sometimes is. The game has a small tutorial, but that will only get you started. There's no other help menu available. A lot of the times, you'll be left guessing as to what to do next. My advice, when in doubt, inspect the room once more. If you have a rather full inventory, there's something you need to do with those items. You're looking at beautifully designed backgrounds, characters and artwork in general. The game has a few issues if you're not positioning an object you want to use on another exactly on top of it, but the general movement is smooth and carefully done. On my 3G, the game crashed quite a lot, at intervals of 10-15 minutes of gameplay, so be sure to save often. Escape the room is not your regular 99 cents game. It's $4.99 and the money doesn't stop there. Although you don't need any of the game's available objects for purchase, if you're stuck somewhere, there are options that will get you out of the trouble. Safes and puzzles can be solved by using "God's Hand" but use this option sparingly - you only have three uses available for free. After that, if you're stuck you can buy various items to help you via In-App Purchase. Bundles cost $0.99 each, and come in various forms - either safe keys, stage keys, God's Hand, more time, etc. As I've said, these are not necessary, but are available. To get you started, here's a quick walkthrough of the first room (Room 1) you'll find yourself in. 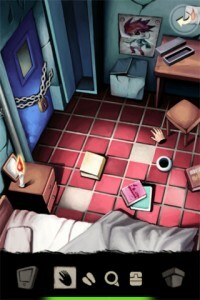 This is actually the second room, but the first room is just a tutorial. So, after all the conversation has ended, start picking up objects. The lighter is on the drawer next to your bed. One piece of a memo is on the floor in front of the big locker, the other piece is inside the locker. On the desk, inside the long box, there's a ruler. In the first drawer of the desk, there's a cutter. Feel free to explore around, but that's pretty much all you need to get out of the room. Go to your inventory, and Mix the two pieces of the memo you found. Go to the Watch tab and tap on the memo. You'll see that it says that there is a strong smell of lemon on the paper. Now go to the Use tab, pick up the lighter and light the candle on the drawer next to your bed (where you picked up the lighter from). Take the memo from the inventory and burn it. This is actually an old trick to hide writing on a piece of paper and it actually works. Going back to your inventory, in the Watch tab, tap on the memo and view the details. You'll get a four-digit number, which is a safe-bet that it's the combination to a safe. Now, to find the safe, pick up the cutter from the inventory, go next to the desk and cut open the poster of that red-haired guy. Bingo, the safe! Tap it, enter the combination and pick up your key. Use it on the lock on the door and tap the footprints cursor and walk out. You're done! 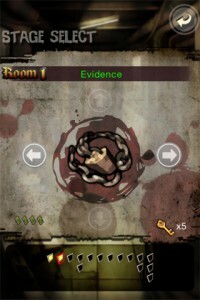 The next rooms will force you to use your intelligence more, but always be on the lookout for objects and clues. You need to find the right things in order to solve puzzles, and that's the key to the whole game. I've finished the first 6 rooms and used God's Hand only once. There are 15 rooms in total, as far as I've counted. Good luck! I highly recommend the game. It's not your regular time-waster, but it is very addictive. 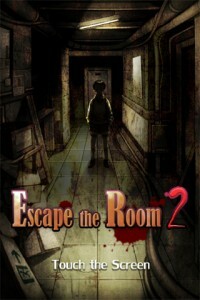 What do you think of Escape The Room 2 ? Scroll down for our comment section and let us know! Hi! 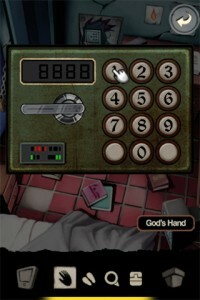 If you like iPhone room escape games, make sure you check out RoomBreak and Antrim Escape 3. Both great games sure to challenge you! Did anyone solve the first dice puzzle without gods hand?! I had number 5214 and should have turned it to 9635 or sumtin like that.. I can't figure out what to do after the explosion in the dice looking combos. I believe it's room 11. There is two electric generators, a broken elevator, and a bookcase. I've already solved the blown up room to the side and the bookcase, but the dice looking things are killing me. Help? Is there a walkthru up for this yet? I cant find one. How do u solve the clock puzzle? Hi, anybody can help me find yellow memory card at room 9? I'm on room 5!!! I don't get it!!! I also finished 4 but I don't freakin get 5 please help!! Omg!!! I've been at this game for 3 days and I got out! Skipping rooms 4 & 11 Both of those rooms u can skip through but the game isn't complete... Both rooms have dice looking combination thing which I can't crack and I'm out of gods hand. Help! I'm willing to help everyone thru the game to get u guys to my level and maybe one of u can crack the dice combo. Id ask for help on ten but I doubt everyone's numbers are the same. Saying as mine keep changing. im stuck in room 3: where we need to light the hidden pathway behind the bookcase. What can I do? On the number 315 i have to do it with 5 numbers , what numbers shoildni use ? how did you get out of room 9? I'm stuck on room 3, any answers? Can you post a screenshot of the room to refresh my memory? I need HELP on that too!! i know X is 1423 but what the heck does the heartbeat monitor with the Y mean?